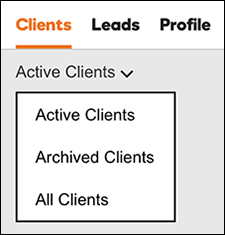 GoDaddy Pros can remove clients from the Active Clients list by archiving them. Information for archived clients can be viewed at any time. Data for archived clients is never deleted, and it's easy to return archived clients to the Active Clients list. Click the client profile you want to archive. On the Client profile page, click the archive icon. A message confirms that the client was archived. When you return to the Clients list, the archived client is no longer in the list. To see all your archived clients, click Active Clients and then select Archived Clients.